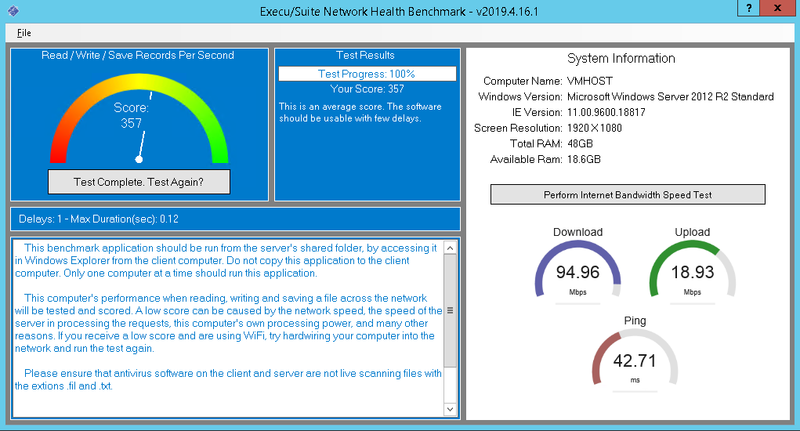 Because it's often difficult for technicians to determine whether or not your network is adequate to run our software, we provide a benchmark application that provides a score and lets you know what you can expect. This benchmark application only tests the time it takes to open a file, read it, write one record and then save the file across the network. This isn't necessarily an indication of your overall network speed, internet speed or speed when transferring large files. 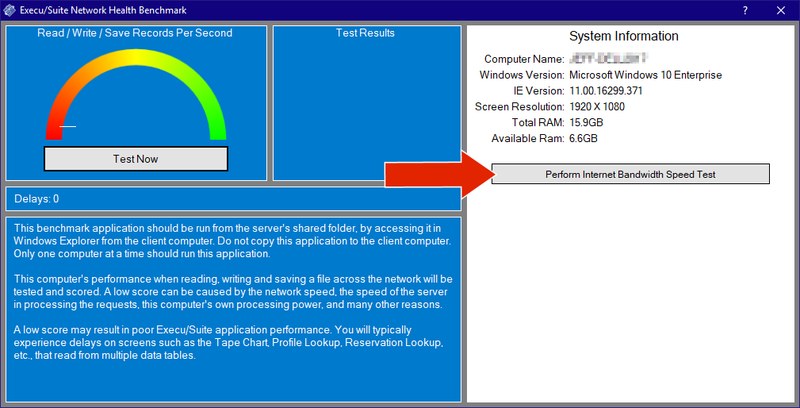 This benchmark application won't detect intermittent network problems if they don't happen while the test is running. Any sudden jumps in the score, up or down, could be a sign of an intermittent network problem. Place this application on your server in the shared Execu/Tech software folder! DO NOT place this file on the client computer. The results will be invalid. 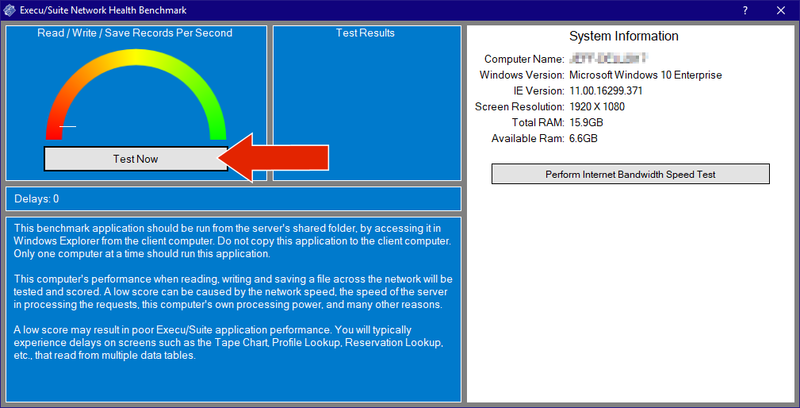 From the CLIENT COMPUTER, browse the network and find the application hosted on the SERVER. Run it from the server by double clicking the application. This benchmark should only be used to gauge potential performance when using Execu/Suite software. Ask other software vendors for their preferred benchmark application. Execu/Tech Systems is not responsible for your network and computer hardware. If you're experiencing network or computer hardware related problems, we provide this benchmark tool for your network technician, but we can't fix these problems for you. This is an unsupported FREE utility. Our technicians can't help you with it and the only information available for this utility is on this page. If you're receiving a poor benchmark score, make sure that your antivirus is properly configured. 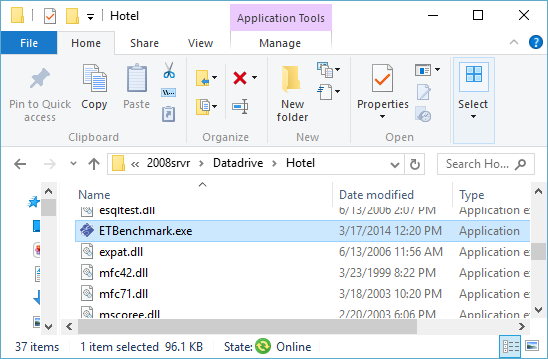 Using Windows File Explorer, browse to the shared folder on the server where the Execu/Suite software is installed and double click ETBenchmark.exe. Click Test Now to begin the test. While the rest is running, the file containing the rest records will grow. Because of this, it is normal for the benchmark score to lower slowly throughout the test. After this first test completes you can "Perform Internet Bandwidth Speed Test" This will test your internet connection. After the benchmark application has completed the test, results will be displayed and an estimate of your expected performance will be displayed in the Test Results box. The score represents the number if times per second that the client computer is able to open a file on the server, read it, write a single line, then save the file on the server. Low scores can be a symptom of a problem that has the potential to corrupt your data and lead to critical and unrecoverable data loss. 0 to 70 This is a very poor score. The software will be unusable and you are risking data curruption. 71 to 100 This is a poor score. The software may be usable but you may experience extended delays. 101 to 150 This is a below average score. The software may be usable but you may experience delays. 151 to 200 This is a low average score. The software should be usable but you may experience slight delays. 201 to 500 This is an average score. The software should be usable with few delays. 501 to 900 This is an above average score. The software should be usable with few delays. 901 + This is a high score. The software should be usable with few delays. In the middle of the benchmark application, the Delays box shows you how many times it took longer than 1/10th of a second to open, read, write and save the file. Delays are normal but the more you have, the more problems you will have. A Max Duration of longer than a second or two might be an indication of deficient or failing hardware (network, hard drive, etc.). A low score can be caused by many things. Based on our experience and feedback from our customers over more than 25 years, these are the most common causes. It's your on site network professional's responsibility to determine the actual cause of the problem and to find a solution. Server hardware doesn't meet our minimum requirements, found here System Requirements. Client hardware doesn't meet our minimum requirements, found here System Requirements.